(1) Minimum Payment and Due Date: You must pay at least the minimum payment amount by 5:00pm on the Due Date in order to avoid consequences. For more information, see How do I pay my UNM bill? and What happens if I can't pay my bill? (2) Billing Date: The Bursar's Office generates bills once a month. Email notification is sent to all registered students informing you that the bill is ready to be viewed over LoboWeb. Bills are not mailed to registered students. Billing dates are determined at the beginning of the semester and published here. For more information, see When do student bills go out? (3) Charges and Payments & Credits: Charges are added to the total amount due, and payments and credits are subtracted from it. A Previous Billed Balance is the total amount due from the last printed bill. Negative amounts in either column represent reversals or adjustments of charges, payments, or credits. For example, a negative tuition amount would indicate a class was dropped. A negative financial aid entry would indicate a reversal of aid. (4) Description: This section displays account activity from the last printed bill, or current activity for new students. You will see an itemized list of charges carried forward, charges incurred in the current billing period, credits, and payments. 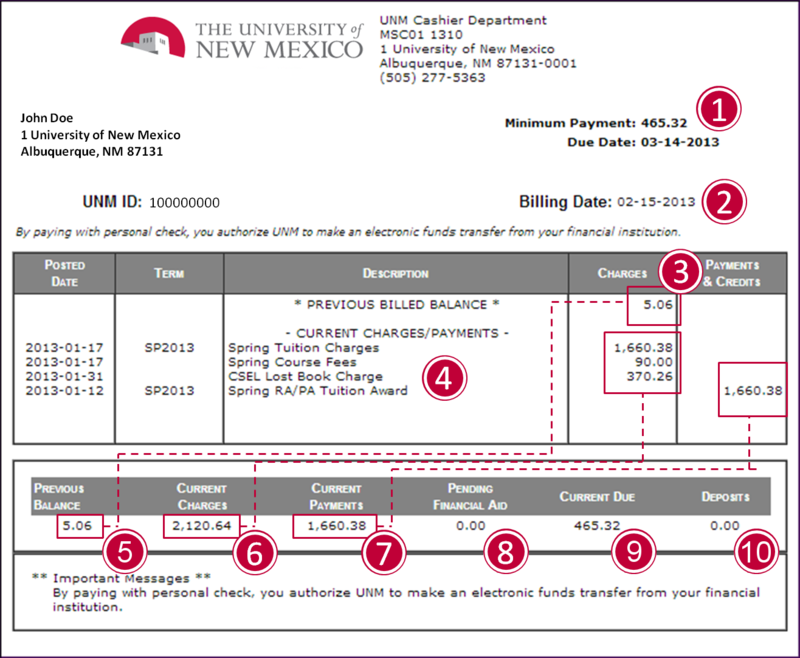 For more information about your tuition and fee charges see Understanding Your Charges and UNM Tuition and Fees. (5) Previous Balance: This section shows the total remaining unpaid amount from previous billing periods. (6) Current Charges: This section shows the total charges incurred in this billing period. (7) Current Payments: This section shows the total credits and payments to be subtracted from current charges and previous balance. (8) Pending Financial Aid: This section shows the total amount of financial aid funds that have been awarded to you but are not able to be disbursed (paid out) as of the bill date. Most often this is because the aid is for an upcoming semester. Pending Aid is subtracted from Current Charges and reduces the Current Due amount. For more information, see How do I check my financial aid? (9) Current Due: This section shows the total amount you owe as of the billing date. The current amount due is the difference between total charges, total payments, and pending aid. Note that this may be different from the minimum payment amount. (10) Deposits: This section shows the total amount of housing deposits for current or future UNM Housing residents. Students will only see an amount in Deposits if they have a current contract (or have turned in an application & deposit for the future) with UNM-owned housing (not LoboVillage or Casas Del Rio.) Once they successfully check out of housing and are not planning on returning, the deposit is then released to their account and is refundedor applied against any balance due. If you would like additional help understanding your bill, please contact the Bursar's Office.